The 36” rangetop offers the most powerful gas burner available to the home – the patent-pending CircuFlame™ sealed center power burner. The CircuFlame burner is the same powerful burner featured on the award-winning Hestan Commercial restaurant equipment. The rangetop delivers extraordinary power and control to standard countertops – not to mention elegant style. The continuous grates and backlit knobs combine stunning form and function, while the precision sealed burner system handles delicate béchamel and seared tuna steaks with equal aplomb. Patent-pending heavy-duty cast-iron continuous grates allow for easy movement of cookware and maximize cooking surface. 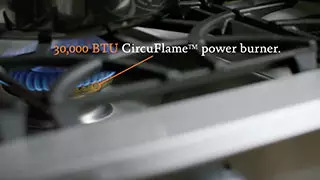 Patent-pending CircuFlame™ sealed center power burner delivers 30,000 BTUs and the fastest boil time – the most powerful residential burner available. CircuFlame™ burner is the same powerful burner featured on the award-winning Hestan Commercial restaurant equipment. Simmer flame precision setting maintains a continuous gentle flame as low as 500 BTUs – perfect for delicate sauces. Patent-pending watertight sealed diamond burner bowl maximizes airflow to burner while ensuring easy cleaning. Exclusive raised burner cap design is easy to remove and clean. Robust electronic ignition/reignition system provides safe, quick and proper gas ignition. Backlit patent-pending knobs and Marquise Accented™ control panel enhance both visibility and style. Shipped standard with stainless steel island trim. *Hestan Commercial Corporation reserves the right to change materials and specifications without notice. 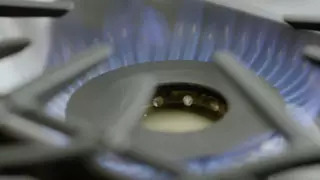 The most powerful burner available to the home delivers up to 30,000 BTUs – so you can go from 0º to crab boil in no time. Available on 5-burner range model. Hestan’s precision sealed burner system maintains continuous gentle heat as low as 500 BTUs without flickering – perfect for delicate sauces. enhance both visibility and style.